Kingdom Harvest began producing and marketing varieties of CBD oil in the Asheville area this year. Margaret & Maxwell, A Wine Salon opened in Biltmore Village in November. The Monk’s Flask bar and lounge has recently opened for business next to the Thirsty Monk in Biltmore Park Town Square. In 2018 new businesses appeared in the Biltmore area of Asheville while others expanded and increased services. Health-related services were among new offerings, which include a new dental practice and a producer of cannabidiol (CBD oil). Dr. Gary Bhatti established a practice on Biltmore Avenue this past spring called Brush Dental. Bhatti is a general dentist who offers a broad range of treatments and procedures from cleanings to crowns and implants with an emphasis on affordable care. He assumed the practice of Dr. Stuart Williams who had been serving patients at the Biltmore Village office. 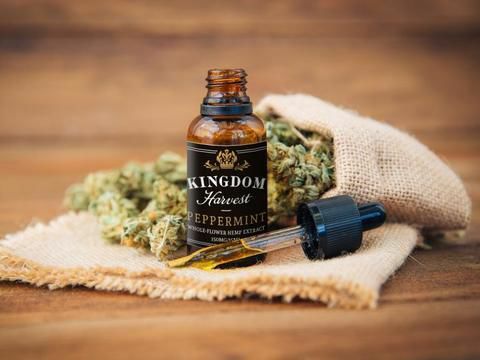 Kingdom Harvest began producing and distributing cannabidiol (CBD oil) after establishing the collaborative enterprise in the Biltmore area this past year. The venture includes farmers, chemists, botanical extractors and marketers focused on a seed-to-sale enterprise. The hemp plants used to produce CBD oil are grown on a farm in Henderson County and sent to the company laboratory in Asheville for the extraction process. The product, which customers buy as an alternative pain reliever and stress reducing aid, is distributed to retailers in North Carolina and Tennessee. A unique wine shop opened its doors in a vintage bungalow on All Souls Crescent in Biltmore Village in November. Named after beloved family members, Margaret & Maxwell, A Wine Salon, offers an extensive collection of wines from all over the world. Owners Paula Tuchscherer-Jones and her husband, Todd Jones, have created a separate bar and lounge area where customers can taste wines and socialize. Rezaz restaurant on Hendersonville Road in Biltmore Village underwent an extensive renovation in spring 2018 to offer a more spacious dining experience to customers. Owners Brian and Laura Smith, who acquired the Mediterranean style restaurant in 2015, decided expand and open its space after months of planning with the owner of the building where the restaurant is located. The private dining room at Rezaz also has been expanded and can now accommodate 50 people for events and parties. In mid-December the Thirsty Monk in Biltmore Park Town Square expanded with the opening of the Monk’s Flask, a spacious bar and lounge next to the brew pub. A place where people can go to relax, the bar serves uniquely blended cocktails as well as signature craft beers, appetizers and other food items. The Thirsty Monk is a franchise specializing in Belgian-style craft beers that has locations in downtown Asheville, Denver, Colorado and Portland, Oregon. Not far from the Biltmore area, French Broad Chocolate expanded with a new factory and cafe on Riverside Drive this past fall. The relocation of the factory from the Pack Square location to RAMP Studios on Riverside Drive has allowed the business to triple its production of chocolates and improve its product, say owners Dan and Jael Rattigan. The original FBC Chocolate Lounge remains at Pack Square.